Left: The gesso stage of an eagle's head from an 18th century convex Hall Mirror. The gesso, applied in ten warm coats, is cut back to reveal the quality of the carving in the wood beneath. 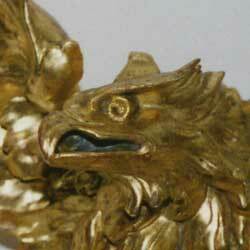 Above: Eagle's head, water gilded and burnished in 23.5ct. gold.